My toller (Tessa) is just over a year old now and i still frequent the group pages Trisha introduces you to. The community is strong and proud, if you're interested in getting a Toller I'd say you've come to the right place. We have nothing but high praise for Trisha and Scott. They really have a world class program for breeding amazing dogs. When you buy a dog you are not getting something from a puppy mill. These are pets that have been loved and trained from the start. This is not our first dog, we have had 5 over the 22 years of marriage. This is the first that I didn’t feel like I was starting from scratch. Our puppy was doing eyes and sit for attention from the moment we picked her up. She is easily the best pup we have ever started with, so I have high expectation for her as a part of our family. The Daintree process is thorough, in a very good way. Making sure you know what you are taking on and patiently answering your question along the way. Take my advice and follow the Facebook group. I did for almost a year before deciding I had seen my pup. The group is supportive and friendly. You will see the care and attention poured into the dogs from birth. Take your time and watch a litter or two grow. See how their owners come back time and again to help other new owners. Your pet selection is a life choice, so choose a supportive group that will help you throughout that journey. After days of thoroughly researching breeders throughout Canada and the US we came across Daintree Kennels. Right away we could tell that they were the breeders for us. At first glance their website and social media are extremely well put together, providing large amounts of information, pictures and videos of their dogs and puppies. Our favorite part is their online presence; frequent uploads of the dogs, the puppies and loads of informational snippets. It feels as if you get to be there as they grow. This only somewhat prepared us for how loving, competent, caring and exceptional Trisha and Scott are. From the interview process through to the Gotcha Event in Nakusp, Trisha has been wonderful, answering every question we had with extensive knowledge and enthusiasm. You can tell that these dogs are her inspiration and see how deeply she cares for each and every one of them. To us this shows through each one of Dainetree’s puppies. They are so well tempered from the use of Puppy Culture methods, and the individual attention each puppy receives from both Scott and Trisha. We would extremely recommend going to the Gotcha Event! 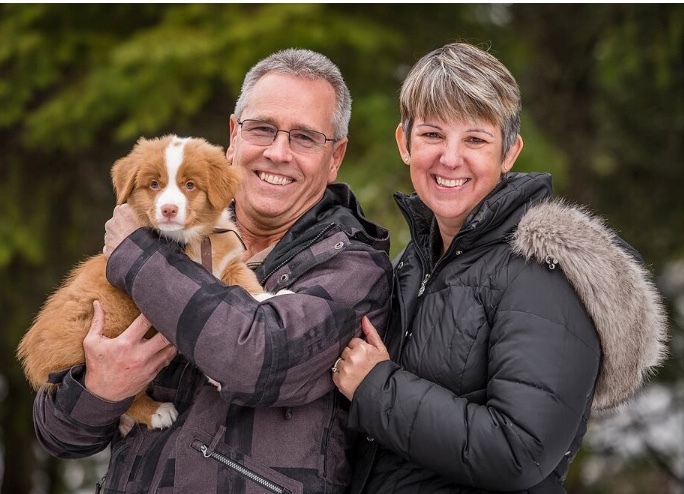 You get to meet all the puppies you have been watching so closely on social media, meet the other new owners of the puppies, which in itself is priceless, not to mention the lovely trip to beautiful Nakusp, BC. The whole Daintree group was so accommodating providing food and snacks, as well as being wonderful company. They definitely make you feel like you are part of their family. We have learned so much from this experience and are so glad that we chose Daintree Kennels for the adoption of our puppy. He is remarkable and amazes us every day with how smart and sweet he is. We cannot thank Trisha, Scott and the Daintree team enough for our new wonderful dog. Paige and Maverick on the day he went home with her. Pic: Tasha Hall, BC Farm and Family Photography. There are a number of reasons why people are attracted to Daintree, but for us it was how much time, effort and care is put into the puppies before they leave for their homes - this is a really critical time in puppy development, and Daintree uses it to its fullest. After bringing home our puppy Piper (litter name "Thistle"), this effort really shows. We have had her a few weeks now, and everyone has remarked on how calm she is in new situations. She has met many people, including children and babies since we have had her - and she has been a rockstar. We tend to be skeptical people, and at first we weren't sure about the Puppy Culture Method (and the videos we had to watch!) but we're so happy we did watch them, because it has left us better equipped to raise a well-adapted and resilient dog. In the short time we have had Piper, we have found Trisha to be helpful and prompt with our questions - something as first time puppy-parents we really appreciate! We're really happy we decided to make our first puppy a Daintree puppy, and we are so thrilled that Piper was matched to us. We can't wait for her to be part of all of our adventures! Nick, Sarah and baby Piper. For starters, our puppy is absolutely amazing! She already knew how to use the potty box, sleep through the night in her crate, and mand (sit and make eye contact with humans to get attention). It is Trisha's incredible hard work that makes such amazing puppies possible. Gotcha weekend was a fantastic experience and Zac and I are so glad that we got to meet Nala (Lupine) and her litter mates with their new families. We feel like we are part of a community raising our puppies together and it is great having them and Trisha there to help us out through the process. We would definitely recommend Daintree to anyone looking for a perfect little Toller in their life! Trisha will go above and beyond for every single puppy. We feel so happy to have gotten our puppy from Daintree. We put a lot of research into deciding from whom we were going to get our puppy. Years after first hearing about Daintree and a few months of researching Daintree and other breeders, we were finally ready to apply. The application process is very thorough and helps much to make sure that this breed and Daintree are the right fit for you as a future Toller owner. At the end of it all we were left with no doubt that we were ready to get a puppy from Trisha. Trisha puts so much care and attention into raising all the puppies. You can really tell that raising them to be confident and enriched puppies is a priority of hers. Having applied and been accepted before the litter was born meant that we got to be part of much of the daily goings on in raising the puppies. The amount of communication and education provided is remarkable and makes such a difference for the first few days after bringing your puppy home. Trisha really does want what is best for her dogs and takes all the steps possible to ensure that they are going to loving families that are knowledgeable about the breed. Gotcha weekend was a fun and incredibly valuable experience. All the activities that Trisha planned are there to help you feel more comfortable taking your puppy home. She is there to answer any questions you have . The time devoted to this is remarkable. Having Trisha choose which puppy best fits your family is another amazing part of the Daintree experience. After watching the puppies grow and having close contact with the purchasers, she is able to make informed decisions based on the puppy’s and the owner’s needs and wants. Having your puppy handed to you for the first time was truly amazing. Overall ,it was an unforgettable and valuable experience. We really can’t say enough about how amazing Daintree is and how happy we are with our newest family member. - Cassie and Rogan with baby Sunshine Jean formerly Heather, the Celtic litter. We are very happy with our Daintree experience. Right from the start, the communication was excellent. There is so much time and care put into matching your puppy and making sure you are on board with everything involving this breed. We have never seen this type of commitment in a breeder. Trisha's main concern is matching her puppies for a long and happy life with clients. She is so helpful with concerns and questions, very knowledgeable and happy to share that with others. These dogs are so prepared to leave and start their lives in their new homes. I really don't think she could do more to prepare them. I would recommend Daintree to anyone wanting a wonderful pet. Murray, Oatis and Linda of Nanaimo BC. I've wanted to get a dog of my own for the past 25 years, but it wasn't until five years ago that I fell in love with Tollers when my friend brought one home. Now after five years of researching Tollers, I finally felt I was prepared enough to raise a puppy and that Tollers were the right breed for me. However, I was dissatisfied with the many breeders I came across until I found Daintree. I could tell based off of the website and in communicating with Trisha how dedicated she is to raising her Tollers to be the healthiest and happiest dogs out there. Trisha offered a partnership in raising the dog, I didn't feel like I would be abandoned by the breeder after exchanging payment. I felt that I would be welcomed into a family, and that's exactly what happened. Throughout this entire journey, I've felt supported by Trisha and Daintree. From the first message I sent her on Instagram to this first week home with our new puppy, Trisha has provided an open door of communication. She never made me feel bad for asking even the simplest question. Gotcha Weekend was great! She provided such a special ceremony, revealing to each family which puppy they were taking home and having professional photos taken to capture that very special moment. She offered great real life training tips and a safe space for us to play with our new family members. In order to get our puppy my girlfriend and I drove into a different country and back, a total of 22.5 hours round trip in 48 hours. It was not the easiest walk in the park; including getting stuck in the snow, a power outage, multiple pit stops for our puppy and the guilt of driving with a puppy for 12.5 hours but we would do it all over again in a heartbeat! These dogs have a beautiful coat of fur, are on the way to fully potty trained, and know how to mand by the time Trisha sends them home with you. Not once did our boy have an accident in the car, and was able to communicate to us when he needed something, all thanks to the time and immense effort Trisha and her team put in. Alexandra, Chico and Mario on the day they met. Pic by Tasha Hall, BC Farm and Family Photography. The whole experience has been wonderful; I highly recommend Daintree! My husband and I are very thankful to have a Daintree puppy. I am a first time puppy owner and the experience couldn’t be better. It was great to be part of the group setting when picking up the puppies. It was informative and so much fun. Trisha is very thorough when deciding on families for her puppies and shares an incredible amount of information to help you prepare. Trisha’s puppies are not regular pups. She has prepped them to be well adjusted pups with a solid base from Puppy Culture. They already have clear understanding of many behaviours with positive reinforcement. She is always there for support and advice which also includes her circle of experts. Trisha sets you up with a Facebook group for your litter so you know how the other pups are progressing as well. That’s so awesome! Our Zoe (Cotterpin) has been such a great addition to our family. The whole experience has been wonderful and I highly recommend Daintree Duck Tollers. From the first conversation with Trisha to picking up your pup, it is absolutely clear she is doing it because she loves dogs with all her heart. If you are thinking about getting a toller, Daintree is the best option. Brent and Corrie with baby Zoe (formerly Cotterpin) on Gotcha Weekend. Photo: Tasha Hall, BC Farm and Family Photography. I started my search for a breeder last year after waiting for a time in my life that would allow for a dog. I settled on Tollers and hit the internet looking for options. Initially I searched for a breeder close to home and after finding a few, I came across Daintree in a lot of comments and threads. Daintree’s level of communication and interaction is second to none. The screening process gave me confidence that I was dealing with a competent, caring breeder that was genuinely interested in finding suitable matches for her pups. As a first time Toller owner Trisha really helped me out prior to and after taking my puppy home, answering questions and giving advice. My little Norah (Mokey) is a delight and extremely well adjusted. She’s adaptable and smart and that is a result of her upbringing at Daintree, she is an absolute delight and I can not thank Trisha and her staff enough. A shout out to Trisha...her puppies are top-notch. Also Trisha made me feel welcome and took her time in answering all of my questions and at the end I felt super comfortable and prepared. Thank you Trisha! Also know Copper (Gwen) is forever loved 💕. 5 STARS out of 5 for Daintree Kennels and Trisha!!!! I had researched Duck Tollers for a while before finally contacting Daintree Kennel back in May. I can tell you that I was very impressed with the website and all the information- the huge amount of links and the entire story and history of Daintree and the breed. I liked that the site includes a lot of info on raw food diets and vaccination protocol (which was huge for me). No other Breeder and Kennel that I had researched offered this much info ( Not even close). I was very impressed when I sent in my application and they got back to me the next day. The process from there was awesome and I had so much information given back to me from Trisha and Hailey as well ( Her admin assistant). To me this was a huge bonus moving forward. When I had my phone interview with Trisha it was so laid back and easy going and I was impressed. I was also lucky to get in on the Summer Litter ( Muppets and Puppets) and was stoked!!!!!! Trisha made the whole process so easy and created us a private facebook page that was unbelievable with daily videos and pictures and updates on the puppies from the day they were born. She answered many questions from all of us and we could see the puppies grow. No other breeders that I know of do this and make you even more interested for the day you get to pick up the puppy!!!!!!! 1 thing I will say is when I booked my room to go pick up the puppy I told the lady I was coming to pick up a Duck Toller and she said right away “Oh you are getting a Puppy from Trisha? You are so lucky as they are beautiful puppies and Trisha is great” well when I heard this I figured WOWSA!!!! What a compliment and HUGE endorsement for Daintree Kennels and Trisha, that is a huge Feather in your Cap Trisha that people respect and like you enough to say that!!!!!! I finally got to meet Trisha a few weeks back when I went to pick up Shamus (Kermit) and it was very nice to finally meet her and of course Shamus. I cannot be happier than I am with Shamus. He is almost completely house trained already and very smart as his training is going so good ( Thanks to Trisha for paving the way with the Puppy Culture method of raising and training puppies and the amount of time she commits to working with each puppy) as he was trained up so well already at 9 weeks when I picked him up. It was very nice to meet 2 of the other proud Fur parents, but if you get the chance do not miss the planned pickup weekend (I could not make it and had to go on the Tuesday) as you will meet more of the puppy owners and have a lot of fun!!) We had fun the day I went and did a few little training things and washed the pup and bonded with the puppies before we left. I cannot say enough about Daintree Duck Tollers and Trisha Shanks. I am glad I met her and very glad I had the chance to get 1 of her puppies and would recommend anyone to contact Daintree and Trisha if you want a Nova Scotia Duck Tolling Retriever. From start to finish (And it is not finished as I will always be in touch with Trisha and other owners of Daintree Dogs) this was the most fun and informative experience I have had with any breeder I have ever dealt with!!!!! Thanks to Daintree, we have the most amazing new family member. The love, training and attention put into the pups in the first couple months makes all the difference. Baby Tofu meeting his new family. I got my Zia (AKA Caterpillar from the Garden Litter) in 2012. She's my first dog. The process with Daintree was very specific and rigourous, because Trisha truly cares for the wellbeing of her dogs! I chose Daintree for the quality of the dogs, but also for the breeder. I visited her before getting my puppy too! I'd recommend Daintree hands down to anybody! My husband and I cannot say enough good things about Poppy, our new puppy! As first time dog owners we are starting to realize that we are pretty spoiled to have a Daintree puppy! Poppy sleeps through the night and is so easy to train. Everyone we meet comments on her sweet, calm, and gentle temperament. I believe that a big part of the reason she is so easy to train and so adaptable is due to all the time and energy Trisha puts into her puppies from the day they are born. Through social media we were able to watch Poppy and her sisters grow. Trisha took the time to send us videos and pictures daily which we really appreciated. As this is our first dog we have had a few questions since bringing her home and Trisha has been a great source of support. She never hesitates to answer my questions and emails back promptly. In the future if we decide to add another Toller to our family we would definitely get another Daintree puppy.